Alignment determines the appearance and orientation of the texts or objects. This feature allows you to easily arrange and position your objects or texts in your project without a hassle. There is an option for you to align your texts or objects to the top, middle, bottom, left, center or right. You can also have them space evenly (horizontally and vertically). It’s going to be less time consuming and prevents you from manually align one object or text at a time. Your project will look clean and neat visually with no clutter. Select the objects or texts that you would like to align by holding down the Shift key on your keyboard and clicking on the objects. You can also select by clicking and dragging your mouse over to the objects in which you would like to align. Once selected, you will see Align to at the top right side of the panel. Click on it and select one of the alignment options that you want in the dropdown. Tip: Align to option will only show up at the top right of your screen when you select more than one object. If you have three or more objects that you want to space evenly (equal distance between objects or texts), here is what the Spread Evenly (horizontally and vertically) tool would do. Select the objects or texts that you would like to align by holding down the Shift key on your keyboard and clicking on the objects. You can also click and drag your mouse over to the objects in which you would like to align. The objects will spaced evenly horizontally or vertically based on the options that you have chosen. At this point, you can align your objects. Aside from the alignment tool, you can also arrange the objects in the order that you like. This is important if you have many layers that are overlapping each other because it will let you know which objects are in the front or back. In addition, it will be a lot easier to click on the objects if you place them in order. There are two ways to arrange your objects. One way to arrange your object is by selecting on the object that you would like to arrange. 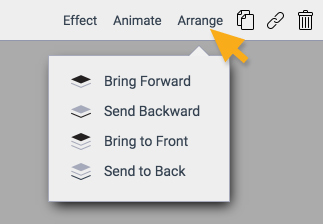 You then right click and select arrange in the dropdown and choose either Bring Forward, Send Backward, Bring to Front or Send to Back. Bring Forward: It will bring your object on top of another object. Send Backward: It will send your object to the back of another object. Bring to Front: It will bring your object to the top of all other objects. Send to Back: It will send your object to the back of all other objects. Tip: You can only arrange one object at a time. If you selected more than one objects, it will not show the arrange option. Another way to arrange your object is by selecting on the object that you would like to arrange. You will then click Arrange at the top right of your screen. Now you can choose an option to arrange in the dropdown.